Continuing our journey down memory lane... It was 2006. Apple was dominating the mp3-player market and so far ahead of the competition that it wasn’t funny anymore. Apple pulled a classic Sony move and introduced the unbelievably compact iPod nano a year before. To annoy everyone even further, they also launched what is arguably the best iPod in history, the 5th generation iPod. So what was there to do for Apple? Build a speaker for the iPod of course. The only thing people seem to love to talk about more than Apple’s success are their failures. The iPod Hi-Fi is considered one of the classic Apple failures. Apple discontinued it just a year after its launch and it received universally lukewarm reviews. I’ve always had a crush on it though. It’s a beautiful piece of hardware and I've always loved the idea of having a speaker that pairs perfectly with my iPod. Steve Jobs famously came on stage and announced that he replaced his personal Hi-Fi system with the it. Everyone called BS. The designer in me didn't care. Just look at it, it's one of the most beautiful audio systems ever made. After a long search, I finally found one. The Hi-Fi is smaller than I had expected. It’s hard to call it "compact" but it’s not much bigger than a shoebox, which isn’t bad. It also has a pretty quiet voice in terms of design (especially with the grille on), allowing it to fade into the environment in a Braun-esque manner. It’s perfect for someone that lives in an apartment or wants something unobtrusive for the den. It’s not common to see a product made at this scale with craftsmanship this exquisite. I think this is the root of the fascination we have with the Hi-Fi. The entire product is made from PC-ABS (guessing, but pretty sure) and has a unibody construction. It doesn’t make business sense to make something this large using the same methodology as its smaller siblings. Yet that’s what’s been done here. Self-respect is what this is. Like the TMA-1 Monolith, the iPod Hi-Fi refuses to show how its been constructed. Until you take the front grille off, you cannot easily decipher how this product was constructed. There’s also no sign of drafting or flashing and you simply come to the conclusion that this is something special, not a collection of manufactured parts put together in a factory. This is how you build hardware that excites. The built-in handles look uncomfortable to hold but the opposite is true. Apple has put radii just large enough to make them feel like they’re improving grip rather than digging into your hands. The handles are seriously handy considering that the speaker weighs 6.6 kg. Up top is a 30-pin dock connector to dock your iPod. It supports Apple’s universal dock adapters. Below are the touch activated volume controls. Despite having a standard dock connector, the iPod Hi-Fi doesn’t support modern iPods or iPhones. This is because older devices required a higher voltage to charge - a vestige of the firewire days. The Hi-Fi looks best with period correct iPods docked anyways so I usually have my 1st generation iPod nano or the 5th generation iPod docked. One of the biggest criticisms of the Hi-FI was the vulnerable position of the Hi-Fi. People were worried that they might break the iPod off. Maybe it's because I don't have kids but the placement doesn't bother me. I actually like the way it makes the iPod the center of attention, giving it a heroic stance. When the iPod Hi-Fi was launched, a software update for the iPods were sent out in unison. It enables the iPod to display full-screen album art when playing music and allows you to change the speaker's settings via the iPod. On the back, there’s an audio minijack which also supports optical input via a Mini-Toslink connector. The iPod Hi-Fi is controlled using Apple’s universal IR remote with the receiver positioned on the front of the device (notice the tight tolerance around the IR window). Unlike Apple’s docks, the Hi-Fi doesn’t recognize the remote’s “Menu” button. Instead of going into the iPod’s menu, the Hi-Fi will instead switch sources between iPod and aux. The only status indicator on the Hi-Fi is an LED on the front face. It shines whenever you press a button on the remote and is bright enough to blast through the fabric grille. I love it when lights shine through materials like this. A fabric grille to protect the drivers largely dominates the front of the speaker. 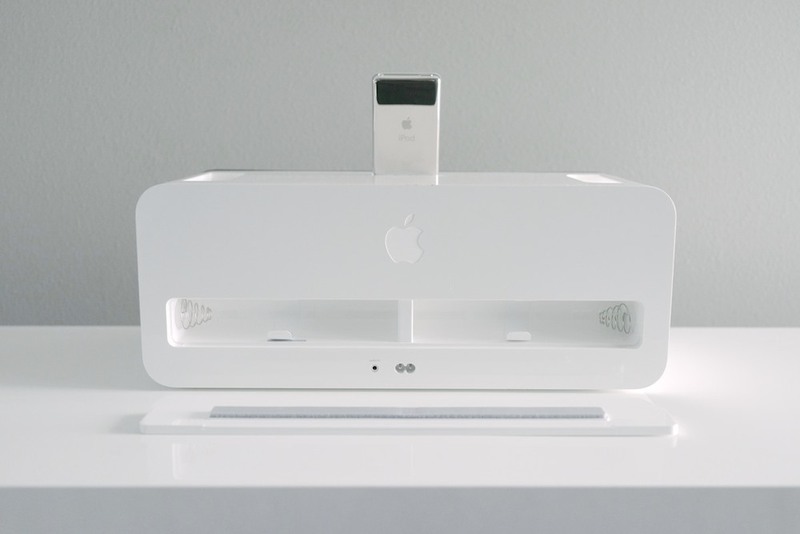 It’s acoustically transparent and also helps the iPod Hi-Fi look visually transparent, disappearing into its environment. The back of the grille is in classic Apple fashion, just as pretty as the front. The architectural beams are all injection molded parts. 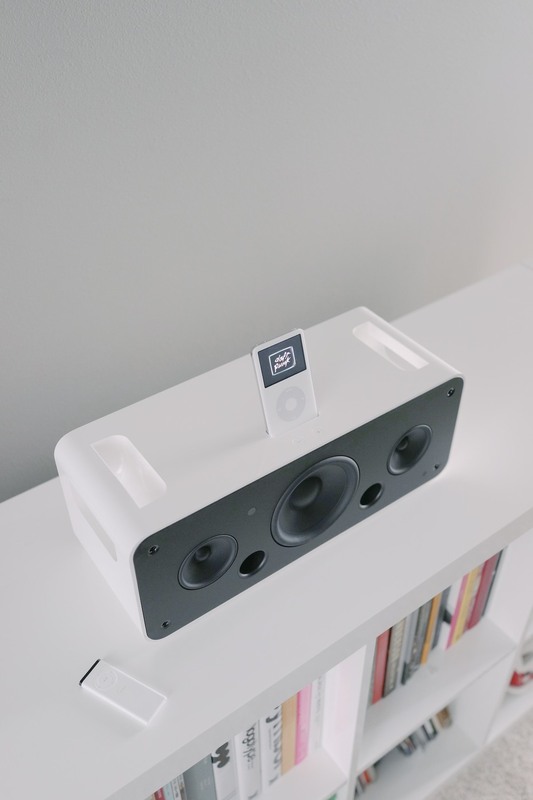 The grille attaches to the iPod Hi-Fi using a series of pins that click into sockets on the speaker. The pins of the grille snap into four sockets on the outer perimeter of the speaker. A magnetic solution for mounting the grille would have been preferred so you didn’t have to see these holes: my primary reason for using the Hi-Fi with the grille installed. The back is pretty barren. Next to the audio jack, you can find the power connector. Unlike many speakers, the Hi-Fi conveniently has an internal power supply. From this view, you can appreciate the razor sharp edges, something Apple still achieves with great precision. Above the power connector is a coin operated latch to access a battery compartment. I rarely carry cash so I had to dig around my apartment before I found this coin to shoot this picture. Are we already outdating this latch? With the cover opened. The iPod Hi-Fi supported battery powered operation using six D-cell batteries. I cannot for the life of me remember when I last used D-cells. This is the most substantial battery cover I’ve ever held by the way. It’s beautifully molded and extra thick – probably to reduce waviness on the plastic’s surface; something that can happen easily on a part this big. Other than mice and keyboards, it’s pretty hard to come across a battery compartment today. It’s even harder to come across one this beautifully made. The design of the pull-tabs and contacts are what I check out first, and they're both attractively handled here. My favorite will always be the Magic Mouse’s though. Apple suggested that users take their Hi-Fi around the house or out to the patio. It seems insane to me that you would invest in, and throw away six D-cell batteries every 14 hours just to listen to music. Thankfully Apple supplied a pretty damn long 9.5’ power cable with the Hi-Fi, which was great for those that didn’t like wasting batteries. The bottom of the Hi-Fi features a massive rubber foot to prevent vibrations and protect the Hi-Fi. It’s yet another signifier of the care that has been put into this product – having multiple smaller feet would have been functionally adequate and much cheaper to produce but the “right” decision was made to go forth with one big foot. In addition to the PC-ABS external housing, the inside of the Hi-Fi is reinforced by a secondary wall made of glass fiber reinforced resin. This creates a low resonance surface and an extremely inert and rigid housing that Apple says is crucial in removing sonic imperfection. All of the drivers here are designed in-house at Apple and handmade. The two 80mm mid range drivers are backed by a sealed enclosure and the 130mm woofer is dual ported using an internal porting system. This thing is built like something out of Stuttgart. Though the amount of engineering and finesse is respectable, I would characterize the sound from the Hi-Fi as “muffled”. The Hi-Fi doesn’t sound terrible per-say, but it certainly doesn’t live up to its name. The biggest issue with the Hi-Fi is its claustrophobic treble and muddy mids. It’s possible to muster up a bit more clarity by changing the tonal settings to “treble boost” but this compromises the bass. Stereo separation is also difficult to define and I personally found the sound stage to be lacking. Things do get a bit better when you listen from a distance and crank up the volume a bit. It gets a messy if you go too far, but a Goldilocks' zone of volume does seem to exist here. What the system does have going for it is that its excellent job of filling even a large room with music. The most common complaint with the iPod Hi-Fi was that it was too expensive. I’m going to say something a little crazy but here me out: the problem with the Hi-Fi was that it was too cheap. Let’s think about this for a moment. The Hi-Fi was $350 at launch, which puts it in a similar price range as the Big Jamboxes of today. What Apple should have done is produced something that was like the Bowers & Wilkins or Bang & Olufsens of today. Yes, I’m serious, something at least $500. I think anything beyond that reaches levels of diminishing returns but a $500 speaker system like the Bowers & Wilkins MM-1 will seriously fulfill anyone's musical needs. With a goal as ambitious as replacing a home Hi-Fi system, you really need to impress the audiophiles and $350 is a tight budget to do that in (at least in the audio world). Despite this, I am loving the Hi-Fi's acoustic trait of sounding almost as good off-axis as sitting in front of the unit. It seems like the designers wanted to create something that was better for social listening than critical, private listening. The Hi-Fi is in that way, a stereo for the people - just like the way iPod was. This completely ruins my theory that the Hi-Fi was too cheap, maybe it should have been even more affordable. But why the hell are you called "Hi-Fi" then? Maybe none of this even matters. Maybe Apple got it right the first time with the iPod. I mean, maybe Sony got it right the first time with the Walkman. Maybe we just want to just shut ourselves out of the real world by plugging bundled earphones into our ears. Maybe the failure of the iPod Hi-Fi is evidence of this.